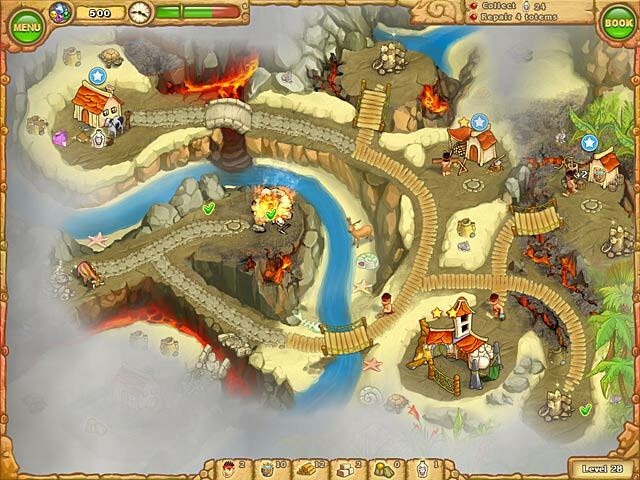 Help the tribe find a new home and discover the wonderful magic of the Altar of Wishes in Island Tribe 2! Having sailed for many days in search of a new home, the settlers come upon a lonely traveler who is lost at sea. Thankful to the settlers for his rescue, the explorer decides to share a secret with them and reveals an old map! 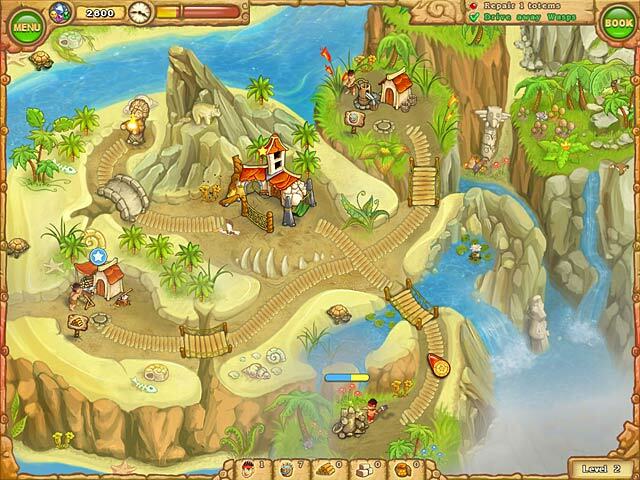 Explore the new islands and find a new home for your tribe in this challenging Strategy game! 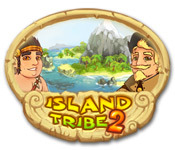 Island Tribe 2 is rated 4.3 out of 5 by 21. Rated 5 out of 5 by chiclets from Surprisingly difficult! I have enjoyed all the Island Tribe versions, But I had skipped over 1 & 2 to play the later versions. I am now in the middle of playing #2, and I've found it to be more challenging than many of the later versions!. As someone who has who has completed all higher versions (several times) with top scores, I am experienced at this game, but already have two levels I have tried twice to capture the gold, and so far have not succeeded! Here are my thoughts on the challenges: There seems to be less time to complete the tasks, and it's easy to run out of time. You do not get any advanced notification on finding "specialty" items, they randomly pop up and it's up to you to spot them and click on them. Sometimes they are not there a very long time, so you can miss them if you aren't watching. The larger jewels come and go as well, do assume they will be there when you find time to grab them. I don't like music in my games, so that is turned off, and I keep the sound low as well so I can't really comment either way on those. Also in general I hate the "stories" in any game (they are notoriously long in the HOG games in particular) and so skip past those as soon as I can. I do enjoy catching the cute tiny little animations in this series, and think they are well produced. A nice challenging version! Rated 5 out of 5 by pik62 from Love these I have bought all of Island Tribe games. I play them over and over. 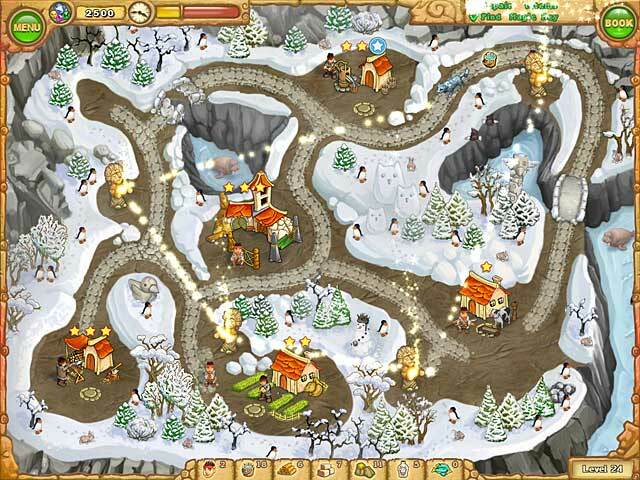 Rated 5 out of 5 by PhoenixRising702 from Still fun to play! Still gives you something to do on a stay at home kinda night! Love all of them! Rated 5 out of 5 by tutortime from Loved it! Loved playing this game. I wish it had been longer than 30 levels. Maybe an Island Tribe 3,4,5…… in our future ? Rated 5 out of 5 by LavaReign from My favorite TMs Island Tribe 1 through 4 are available on iPad and I have to say, they're the most fun TM games I've played! I keep playing others to keep from beating these and always have to come back. Rated 5 out of 5 by mrm2006 from What a great time! After doing the trial run on Island Tribe 1, I was hooked and immediately purchased all 4 in the series. While I thought the first in the series was quite short and relatively easy (beginners will love this game), I just finished spending all day and half the night playing IT2 and loved, loved, loved it! The storyline is simple enough, the graphics bright and the music not overbearing at all. The levels do get a bit harder as the game goes on but you have the ability to replay which is a great feature. There is so much to do! This game offers hours and hours of entertainment and fun. Glam-ma says at least give the trial a go because you will be hooked matey! Rated 5 out of 5 by MrsBano from Fun time management game One on my favourite games. have played several times. Never get bored with it. Rated 5 out of 5 by Eventually from Great Game I enjoy this game and find it pleasant, good story and exciting.